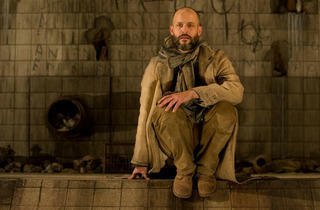 Timothy Edward Kane delivers a one-man epic in Denis O’Hare and Lisa Peterson’s powerful adaptation. In a cavernous, dilapidated sewer, a Poet (Timothy Edward Kane) compares the Trojan War to waiting in line at the grocery store: When a person waits in the same line for 20 minutes and another cashier starts moving faster, principle keeps him in place. It’s an analogy that could easily describe the current U.S. military campaigns in the Middle East, and is one of the clever ways that Denis O’Hare and Lisa Peterson connect classical and contemporary images of war in their smart, powerful and surprisingly funny play. Humor is an invaluable tool in this riveting one-actor adaptation of Homer’s epic poem, easing the audience into the Poet’s tale before he takes them on a devastating tour of the Trojan battlefield. 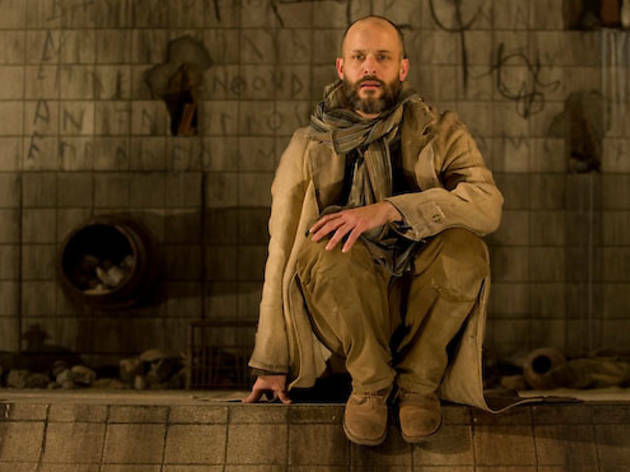 Kane’s stunning performance has the spontaneity of a story told around a campfire, yet his emotional reaction to the narrative shows his profound connection to the material. The adaptation focuses primarily on rival warriors Achilles and Hector, and Kane grows more frenzied and passionate as the two soldiers move toward their brutal confrontation. Rarely is a one-person show so physically taxing, and Charles Newell’s direction keeps Kane in constant motion, capturing the chaos of the battlefield and forcing him to maintain a high level of energy. Todd Rosenthal’s expansive, multilevel set allows Kane maximum range of movement, and the monochromatic surroundings absorb Keith Parham’s lighting. Through color and intensity, the sewer walls become a reflection of the Poet’s transcendent story.